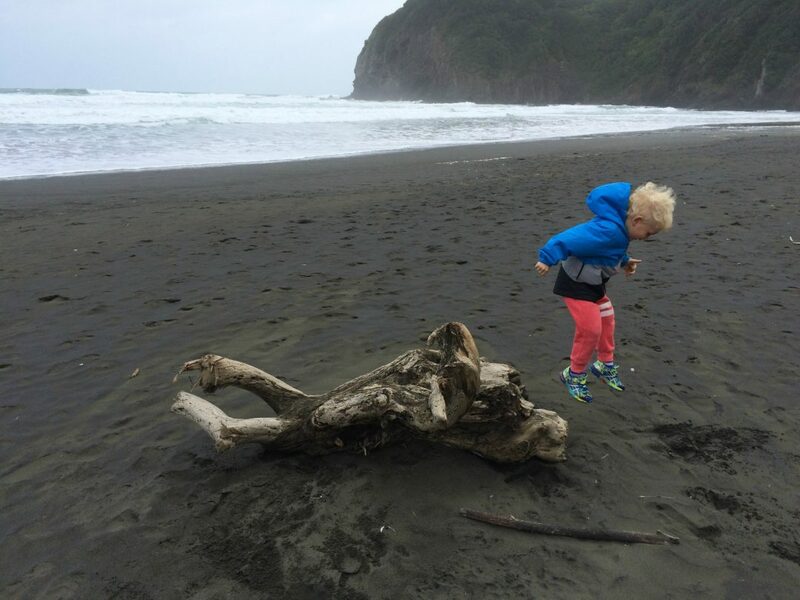 Piha is approximately 45 minutes out of the CBD on Auckland’s wild and rugged west coast. On the way out, make sure you pull over and admire the incredible view from the top of the hill as you emerge from the bush and the ocean unfolds before you. The Piha road then winds down the hill and at the bottom, veer right and head all the way along to the northern-most end of the beach, where the road stops in a car park. Here your adventure begins! Follow the track through the dunes and then walk along the beach until you reach the caves and cliffs at the northern end. 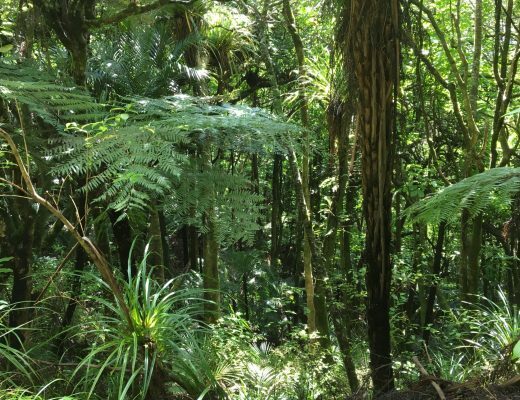 This is where a bit of detective work is required to find the beginning of the track – it is signposted, but you need to find the green sign amongst the green pohutukawa trees! Once you’ve found it, the track itself is very obvious and easy to follow up the hill through boughs and branches. There are peeks of the churning sea below – it’s a little eerie and rather beautiful. You will need to hold small children’s hands here and instruct older children to walk with care. After 20 minutes or so the track arrives at a fork – you can turn left where there are two lovely lookout points (one wooden bench which is immediately in front of you, and a really cool curved stone lookout 5 minutes further up the track to the left, on the headland.) The views here are fantastic. 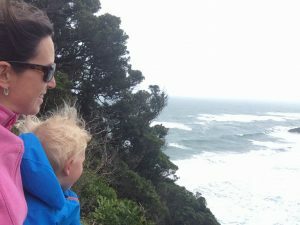 On calm, sunny days, you can see for miles up the coast towards Muriwai, and in wild weather the wind and the surging surf are exhilarating. You can either return the way you came or turn right at the fork to hike down to White’s Beach – very pretty but I wouldn’t take the children swimming there because of the strong rips and currents. It’s a decent climb back up the hill from White’s, too! 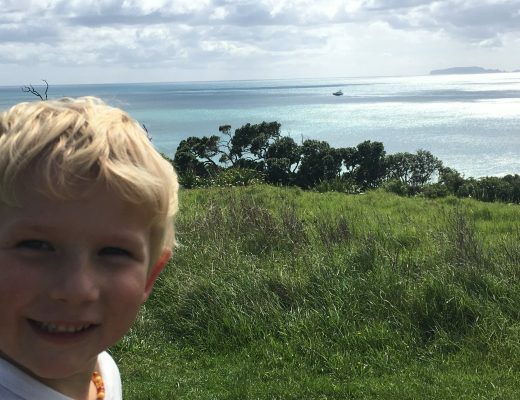 When I have my three year old with me, we usually just go to the Laird Thomson lookout and return, and that is enough for him combined with the trek along the beach (allow around 1.5 hours total, at three year old pace). A picnic at the top is usually a sufficient bribe to get him up the hill under his own steam! You might wish to follow up your walk with coffee and a treat at the fantastic Piha Cafe (in the summer time, I can also highly recommend their pizza and a local beer!) 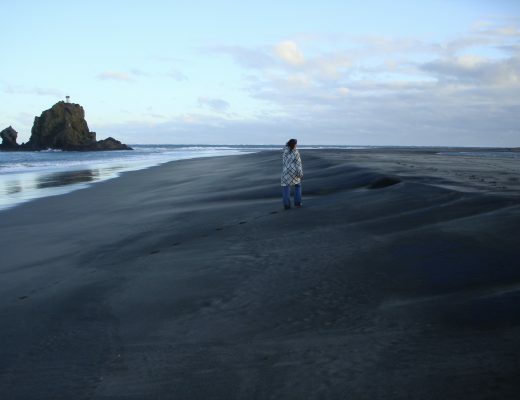 And another tip for summer – the black iron sand here can be excruciatingly hot on a sunny day. Be sure to have sneakers on rather than jandals/sandals to avoid burnt little feet. 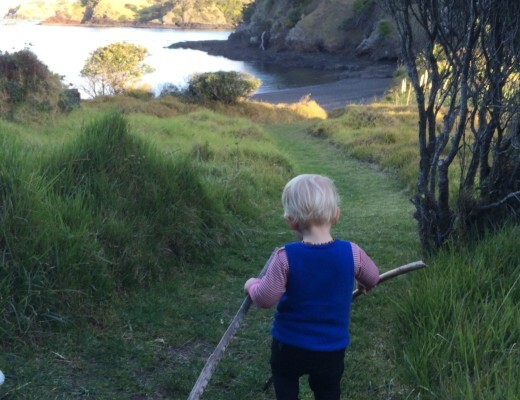 This gorgeous coastal gem is an hour north of Auckland, near Matakana. On your arrival at the Anchor Bay carpark, follow the path to the stunning white sand beach. There are lots of tracks here, many of which are multi-use for walking and mountain biking, so keep an eye out for cyclists – or take your bikes! I recommend that you follow part of the North-South track which begins on the grassy area behind the beach. There is a little information kiosk which is usually open in summer. You’ll hike past another amazing beach and then head up the hill to enjoy spectacular views of Takatu Point, Kawau Bay, Kawau Island. Little Barrier Island, and beyond. You can just amble along at your own pace and then return the way you came once you have had enough. This track is mountain buggy friendly, yay! The entire track is 8km long and ends up at the entrance to the park near the Ranger’s house, and you can return to Anchor Bay along the road to make it a loop if you like. This will be too far for smaller children, though. Enjoy a swim at the beaches or a ramble around the rockpools – it’s a really magic place! 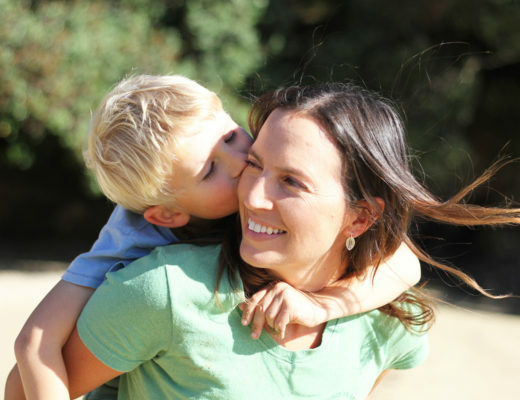 There is a popular campground as well, so if you’d like to stay, be sure to book in advance. 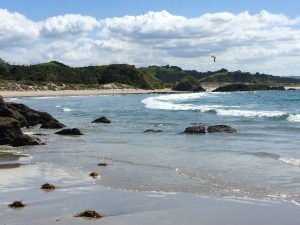 Plus, visit the great Farmer’s Market on Saturday mornings in Matakana – you could make a day of it and pick up your picnic at the market before heading out to Tawharanui on the coast for an afternoon walk. It is the symbol of Auckland, but so many people have never been to Rangitoto – and they’re missing out. Catch the ferry from downtown Auckland to Rangitoto Wharf. The Summit Track begins pretty much where you disembark, and is a fascinating 45 minute hike through the lava fields and pohutukawa forest to the top. 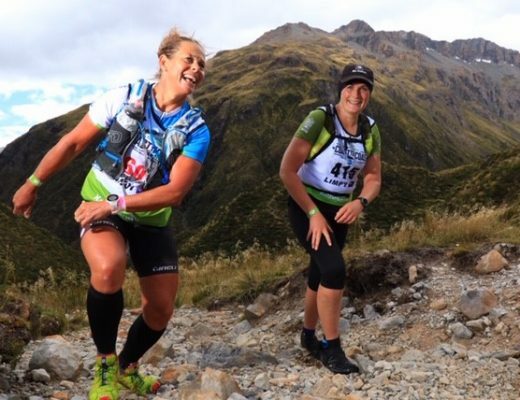 It’s actually only the last 100m or so that is really uphill – but your effort is then rewarded with an awesome view of the Waitemata Harbour, Hauraki Gulf, and the city in the distance. Below you, the crater drops away beneath the wooden boardwalk, reminding you that you really are standing on a volcano! Children are fascinated. On the way back down, you can take a 15 minute by-pass to the lava caves which were formed in the last eruption. You might want to take a torch for this. Pack plenty of snacks and water as it is hot on the island – the heat radiates off the black volcanic rock. And wear decent supportive shoes as the rocky track is sharp in places and isn’t suitable for jandals. 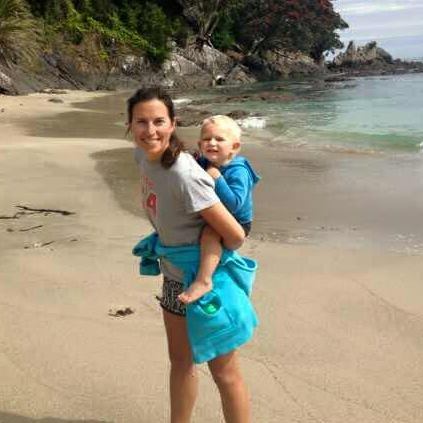 Where do you like to take the family for a weekend walk? Please share your favourite places below! Thanks for these -look forward to trying them. Kitekite Falls at Piha is also a good walk and not too long. 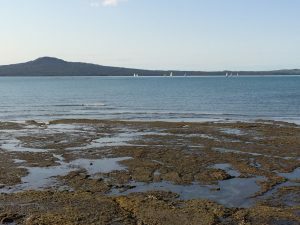 I found Rangitoto a bit slippery as had a toddler in a backpack when we went. A hiking pole would have been useful. Also: we took our two older kids aged 3 and 6 on their first overnight tramp to Peach Cove Hut near Whangerei. The hut only sleeps 8 and we ended up having it all to ourselves. It’s about a minute from a beach. LOTS of steps down to get to it though. I had achy calves the next day.